GENEVA (AFP) - The Court of Arbitration for Sport (CAS) on Tuesday banned Italian cyclist Franco Pellizotti, third in the 2009 Giro d'Italia, for two years, overturning an earlier ruling by Italy's anti-doping committee. 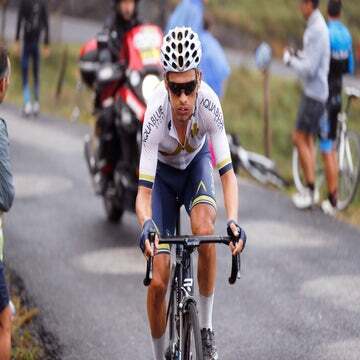 GENEVA (AFP) – The Court of Arbitration for Sport (CAS) on Tuesday banned Italian cyclist Franco Pellizotti, third in the 2009 Giro d’Italia, for two years, overturning an earlier ruling by Italy’s anti-doping committee. The CAS said in a statement that it had partially upheld an appeal by cycling’s governing body, the UCI, against the Italian decision on a doping charge. The CAS “has imposed a two-year ban on the athlete starting on 3 May 2010, as well as the disqualification of all his results obtained as from 7 May 2009,” it added, depriving Pellizotti of his 2009 Giro result. He was also ordered to pay the UCI 115,000 euros (161,000 dollars) as a “financial sanction”. The UCI had called for sanctions on Pellizotti last May as a result of abnormalities detected in his biological passport but the case was dismissed by Italy’s anti-doping committee for lack of evidence. The CAS has yet to publish the full grounds for the decision by its panel of arbitrators. Pellizotti’s defence in Italy had relied on questioning the reliability of the biological passport. The passport is designed to pick up cases of doping by detecting changes in a rider’s blood profile over time, compared with a traditional test which is aimed at detecting specific banned products in a rider’s blood or urine. The passport, introduced in 2008, has helped identify possible wrongdoers who are then subjected to traditional controls. The CAS also confirmed a two-year ban on Pietro Caucchioli, one of the first riders to be suspended because of anomalies in his biological passport in 2009, rejecting his appeal.